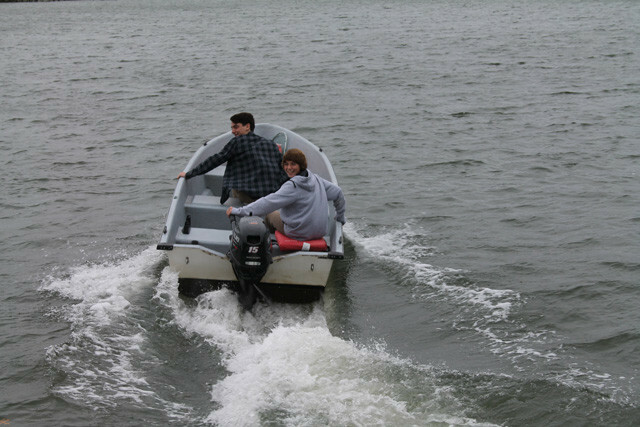 Their first boat: a 14' Apache with a 15-hp Zuzuki outboard. This was a great year for firsts, with me and my sons: they caught their first marlin, they experienced their first over-nighter offshore, and they got their first boat. Yes, their first boat. Their first boat: a 14′ Apache with a 15-hp Suzuki outboard. Now, some folks may feel that 14 year olds shouldn’t be riding around in a boat under their own command. Let me dispute that assertion, with every fiber of my being. We humans learn by doing. Parents can only tell their kids so much, before they tune us out and have to learn things the hard way. And I do remember being 14—and having to learn things for myself. Is there a certain amount of danger here? Sure. And that’s why I wanted to start them off on a simple, small, open boat with a minimal powerplant. They were told to stay inside the river, and act with responsibility. Might they have been tempted to stretch their legs, and try running out into the bay on a calm afternoon? Perhaps, though whether or not they realized it, the fishfinder/chartplotter I installed on the boat would have left a pretty clear bread-crumb trail. Might they have tried something foolhardy, like intentionally jumping the wakes of large boats at high speed? Absolutely. And that’s how they managed to break the transom cap. Was I angry, or alarmed? Heck no—it’s something neither of them will do again, and they learned this lesson without anyone getting hurt, and without doing major damage to the boat. The minor damage they caused, they spent an afternoon fixing. The bottom line? Many of us spend way too much time wondering why the next generation is so dang soft. Why they don’t seem to want to work, they don’t seem to be able to take charge in many situations, and they don’t seem to be able to deal with adversity. We whine and complain that they just want to hang out indoors and play video games all day. You don’t want your kids to turn out that way? I have a great solution for you: let them get their own boat.